Getting WP Rocket up and running usually works like a charm; install, activate—done. … or a number of other files and folders WP Rocket needs to be able to write to. This document gives you an overview of possible ways to troubleshoot issues with file permissions. Please note that contacting your web host about this type of issue may be required in certain cases. Once WP Rocket is up and running, you can continue to protect wp-config.php. However, .htaccess and other files and folders should remain writable for WP Rocket, since their content might need to change according to your settings. Connect to your server via (S)FTP. Find the .htaccess and/or wp-config.php files. They are located in the root folder of your WordPress installation. 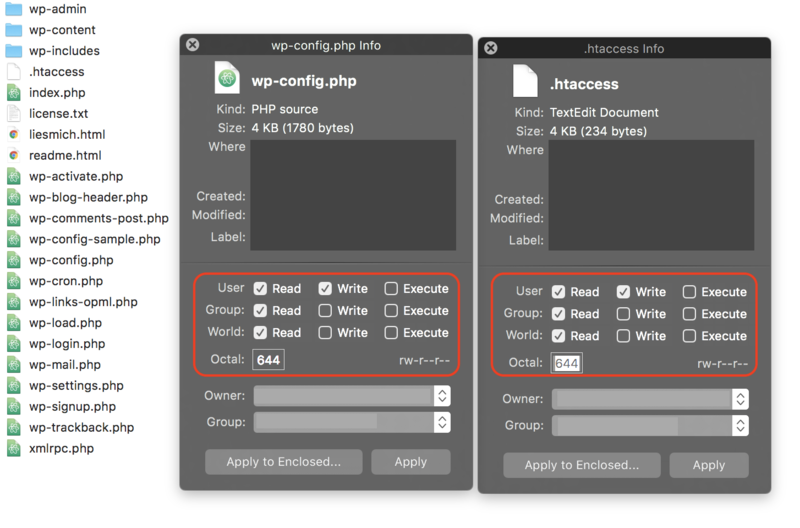 In rare cases, wp-config.php can be located even one level above your WordPress root folder. Depending on your FTP client, you should be able to right-click (or ctrl+click) on a file name and select an option like “Get Info”, or “File permissions..”, or “File attributes” from the context menu. Clicking that option should display some file info, including permissions. Heads up! On some hosting platforms, the permissions need to be different because the user running the web server doesn’t have permission to write files. You can try with other values, such as 664, 666 for files and 775 (even 777 for some hosting platforms). Make sure to consult with your hosting provider about this. We strongly advise against 777 permission settings. If none of the above solves the issue for you, it could be caused by file ownership settings. In this case, contacting your hosting provider for further support is your best bet.